Uniform Study: Red Faced CD Jackets? A Massachusetts museum has a collection of original Confederate garments that are kept in storage. Among those uniforms is a Columbus Depot jacket with red facings. 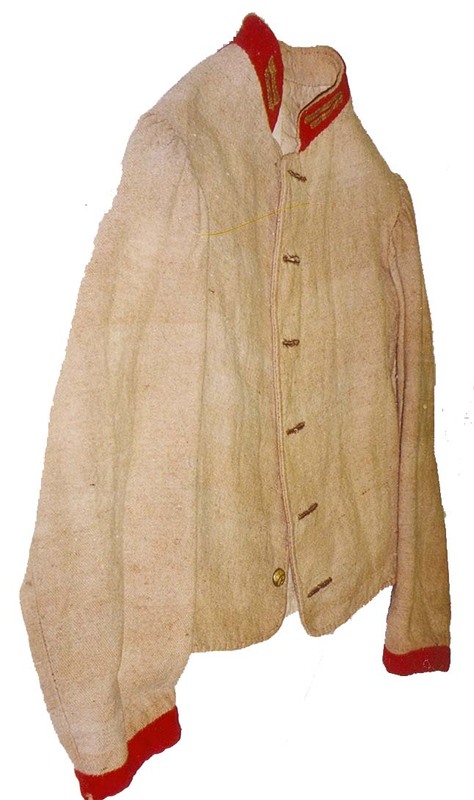 This jacket was worn by an officer who was reportedly captured at Port Hudson. The jacket's pattern and materials are consistent with other surviving CD jackets, but the major difference comes in the facing color. The scarlet collar and cuffs are original to the jacket and have not been added or altered. Some have noted the odd fading patterns of the jacket that may indicate that the cuffs have been added, but those fade patterns are due to the way the jacket was displayed at some point over the last 140 years and not due to an alteration. I can't say how many of these were produced, how many where worn or if this is the only one that survives, but I can say it does meet the criteria to fall in line with the Columbus Depot jacket typology.